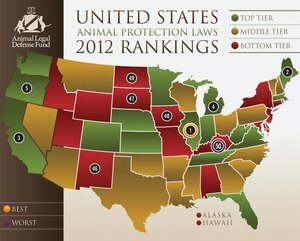 According to the Animal Legal Defense Fund, Minnesota ranked 14th in the nation for the state’s animal protection laws in 2012, placing the state in the top tier. But for the thousands of dogs and cats who still continue to suffer in puppy mills and kitten factories in the Land of 10,000 Lakes, the current laws just aren’t doing enough. Minnesota ranked 14th in the nation for the state’s animal protection laws in 2012. But Senator John Marty (DFL-Roseville) and Representative John Lesch (DFL-St. Paul) are hoping to turn the tides in favor of animal welfare in their state with the introduction of Senate File 36 and House File 84. This legislation would provide some much-needed regulation to keep commercial dog and cat breeders in check and hopefully crack down on the prevalence of puppy mills and kitten factories in the state of Minnesota. According to AnimalFolksMN, an animal welfare action group for Minnesotans, the new legislation would require commercial dog and cat breeders in the state to obtain licenses, undergo routine facility inspections conducted by the Minnesota Board of Animal Health, and operate under tougher penalties for any infractions. The new regulations would not affect what they describe as “hobby breeders,” but would instead target anyone with at least 10 dogs or cats whose animals produce at least five litters per year. “Lots of breeders are very good breeders, love pets and animals, and make a living raising and selling them,” Senator Marty says. But other breeders “cram things more tightly together,” to the detriment of the vulnerable dogs and cats the unscrupulous breeders are supposed to care for. Second Chance Animal Rescue co-founder Nancy Minion explains that the poor conditions at large-scale commercial breeding operations often result in serious health issues for the animals at the mill. Minion has operated her rescue for 19 years and has been trying to get stronger animal welfare legislation passed in the state of Minnesota for 24 years. Opposition from agricultural interest groups and breeders has stifled efforts to regulate large-scale commercial dog and cat breeding operations in the past, but Minion is hopeful that 2013 will be the year change comes to her state. She encourages all Minnesotans to attend a rally in support of H.F. 84 and S.F. 36, which will take place on Tuesday, February 19 from 3:00 to 4:00 p.m. at the State Capital Rotunda. Whether positive change is finally on the way in 2013 for Minnesota’s puppy mill and kitten factory animals still remains to be seen. But Minnesota citizens who support tougher legislation regulating large-scale breeding operations should make their voices heard soon as talks get underway — House File 84 will be brought before the House Civil Law Committee in a hearing February 13.